Another exciting release. YouSendIt is a heavily used tool in the music distribution space. It's easy, free, and secure. But, it falls short in many areas including file size limitations, no playback previews, links expire, and storing music for long periods of time for future use just isn't an option. SourceAudio has just released its new bundling and download tool that allows users to send infinite numbers of tracks, bundle only the file types they want to send, private share the downloads with only those users they want to receive it, and then most importantly, monitor the download and playback of the tracks once they've been sent. 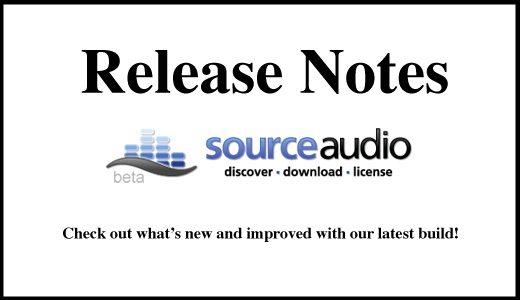 Just another powerful too in the SourceAudio music licensing search and distribution platform. Bundles! - Bundling groups of tracks for download now happens in the background and you'll get an on-site notification when they're ready or an optional email. Much larger bundles - You can now download as many tracks as you want in a bundle and they'll be split into groups of 100. Download Monitor - You can keep track of all your bundling tracks in the bottom bar and download them from any page. Logged out downloads - Catalog admins can send tracks to recipients without accounts and allow them to download without logging in. Received Tab - Logged in users can see all the tracks they were ever sent on a new "Received" tab on their profile pages. Downloads Tab - Logged in users can see all their bundles, both old and current, on a new "Downloads" tab on their profile pages. History Tab - Logged in users can see all the tracks they've played or downloaded on a new "History" tab on their profile pages. This tab replaces the old "Downloads" and "Play History" tabs.